100 Words, 100 Days: Day 98. On Series Finales. | What I think About When I Think About Writing. ← 100 Words, 100 Days: Day 97. On Repetition. 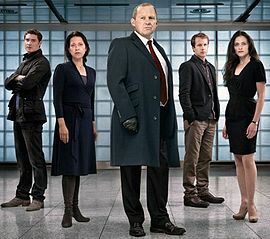 This entry was posted in 100 Days, 100 Words, Television and tagged BBC, MI5, Spies, Spooks, Television, Television program. Bookmark the permalink. Some day I hope to have readers crying for another book in the Numbers series, FIVE, SIX, SEVEN, and more. I’ll raise my cup to this, Rik. And some shows go on long after an ending is warranted. There are few novel-series I have read that I did not read through to the end (or the end so far). The exception is the “Twilight” series. I wouldn’t have read the first if I hadn’t been goaded by one of my son’s friends. However, there a quite a few TV series that I gave up watching long before they went off the air. When you start knowing what’s going to happen or be said before the first two minutes are up, then it’s time to either move on, or become a script writer. Don’t remind me about Twilight. I read it while not quite myself. I know exactly how you feel. I hated losing “Murder She Wrote,” “Boston Legal” and “Law and Order C.I.” Nobody asked me if I wanted them cancelled. We viewers are of no importance, I’m afraid.